You guys!! I have been wanting to make a plush doll for so many months and I finally got it together these past few weeks. It was SO fun. My friends’ kiddo had a mermaid doll when we were at coffee recently, and I had an OVERWHELMING urge to make some for my niece, Penelope. You know that feeling? 2. 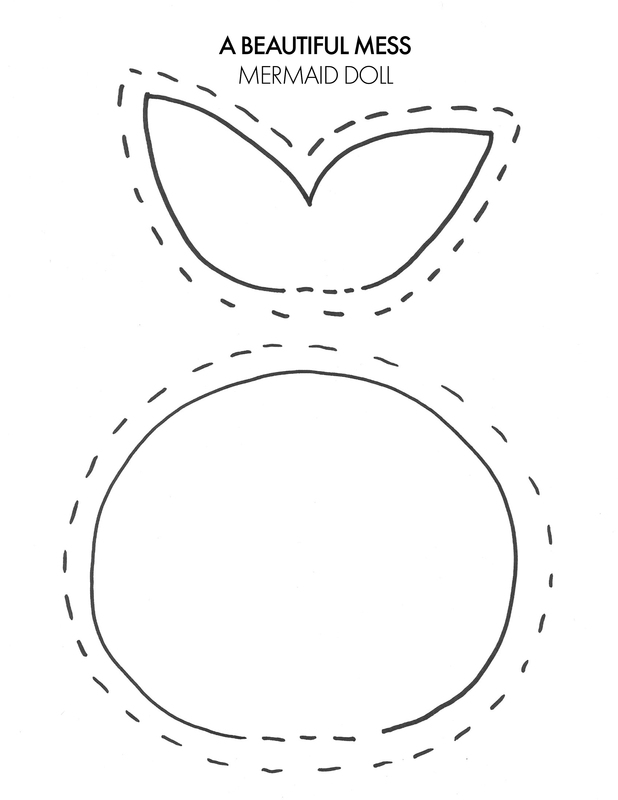 Print our your patterns and cut out your pieces along the dashed lines. 3. Tape the head to the body and the fin to the tail at the dashed line areas so you end up with two patterns. (one for body and one for tail) Fold your cotton and sequin fabric into two layers (right sides together) and use your patterns to cut out the body and tail pieces (add the interfacing to the sequin fabric if you want to). Sew along the edges with a 1/2″ seam allowance and leave the top of the tail and bottom of the body open so you can turn your pieces right side out through those openings. Before turning them right side out, cut a few “V” notches into the turns, and then use a long object (like the end of a pencil) to help you push the fabric back through the opening. Once it’s right side out, stuff your shape with stuffing to your liking (use the pencil end again to push it into the small spaces), and insert the body into the tail opening. Fold the top open edge of the tail seam in towards the doll and hand stitch the tail to the body. 5. You don’t have to add the Sharpie dots, but I find them helpful to keep the spacing consistent. This is the minimal amount of “hair plugs” needed. If you look at the zoomed out photos of both dolls, the purple hair doll has about twice as much hair. It’s easier to style if you put more plugs in, but if you leave it long or in a braid, it looks good either way. 6. Stitch the yarn “hair” into the dotted areas, knotting so it’s secure. 7. When you get to the bang area, you can leave a little gap and then cover it with a braid at the end. Stitch on the bangs and then trim them after they are all attached. Then add a little bit of fabric glue to the forehead and style them straight until the glue dries (if they’re still a little crazy, like the photo below, just keep brushing them down until they relax). Stitch on some eye details or add buttons for eyes. I’m a fan of the sleepy eyes! Don’t forget their seashell buttons and sweet necklaces. Done and done! Enjoy your cute dolls. Oh, and don’t forget—these make great gifts!! The hair looks so cute braided too. Credits// Author and Photography: Elsie Larson, Project Assistant: Laura Gummerman. Photos edited with A Beautiful Mess Actions. those mermaids are so cute and the background is very funny too. I would have loved to have one like that when younger, and a daughter to make one for her…but my boys are more passionate by robots at the moment ! Thanks for this inspiring DIY. These might be the cutest things I have ever seen! I just learned how to use my sewing machine for Halloween, and now I’m obsessed! I see lots of plush dolls in my future! I HAVE JUST DIED OF CUTE. OMG I wish I could sew! I LOVE these!!! These will be perfect for my niece and cousins for Christmas! Thank you for the post! These are ADORABLE! I hope you Snapchat us P’s reaction 🙂 I’m loving the details! Oh my, those are too cute! The details are amazing! Oh these are just so adorable. And how creative again Elsie! Love love love. Adorable! I love mermaids and my girls would love these too! Haha! A robot doll sounds fun. haha- Mer-man! Now I desperately need to watch Zoolander. These are too cute 🙂 I may have to make a couple to keep on hand for when my nieces and friends’ kids come over! OH MY GOD THIS COULD NOT BE ANY CUTER. PINNING IMMEDIATELY. These dolls are adorable! My nieces would love these for chirstmas! These are the cutest!! Ahhh they would make the perfect babyshower gift! Gotta make these for a girlfriend who is due in a few months. They are so cute! I can’t get the patterns to download, I get a tail, an arm, and I guess a fin. This might just be the cutest thing ever! Really cute .thanks for the tip about painting the scalp .I used to make dolls and it was always so time consuming to cover the head completely I have to make some for Christmas presents Thanks again ! These are absolutely adorable! So cute and perfect last minute handmade presents! These are adorable! And doesn’t seem very difficult to make, so I’m bookmarking it and if I have time I’ll try to make them. They would make the perfect Christmas gift for my little cousins. But, I must admit, I’d like one for myself, too! Haha 🙂 You guys are incredible, I’m amazed how you get all those super creative ideas! AHHH! I need these in my life! Oh my!! These are WAY too cute!! 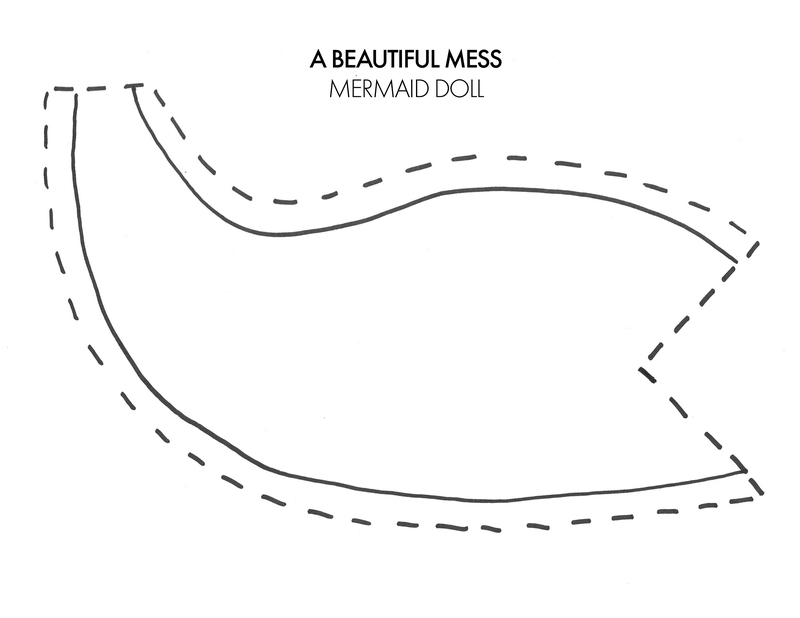 Love them and know my girls will too – I’m going to show them and know what I’ll be making for Christmas… I wonder if you could double the pattern and make a bigger size mermaid! Fun Fun! So cute!!! Would make such great gifts!! These mermaids are too cute!!! Lovely project! Love these they are so cute!! No plushie has tempted me to hand make one myself until NOW! This is the prettiest most magical DIY doll I’ve ever seen! Thanks for sharing with us!! These dolls are just so good. I can’t get enough of how great the hair looks. Great work! I am in love with these and desperate to make one (I’ve picked out all the bits! )… but I can’t print the patterns out for some reason. They are really large, and only some sections print out. 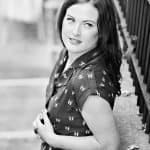 I might be being tech stupid… but can you help?! This is rwally the best project for kids you ever did! Your niece will love these dolls, I’m sure! I’m only publishing your comment to show you that I have nothing to hide. Like I said in the post, I WAS inspired by another mermaid doll toy (not from an Etsy shop though, from the mall). I work so hard to support Etsy sellers and I don’t appreciate your accusation. By the way- the dolls linked here are adorable, so I hope someone sees this and buys one who doesn’t want to sew one. I made my mermaid, she’s sooooo cute, THANK YOU for the ace idea!! I’ve just posted some pics on my Instagram @thisislullaby. Hello Elsie, I love your mermaids!!!! they are so cute!!!! keep your great art girl! I need to make one of these for my little girl that loves mermaid for this Christmas, please can you tell me what yarn did you use for the hair? I’m a little confused about what to do with the hair after the plugs. Hi thanks for this lovely pattern and easy to make wig idea. The women in our Women’s Support group are making mermaids tomorrow. 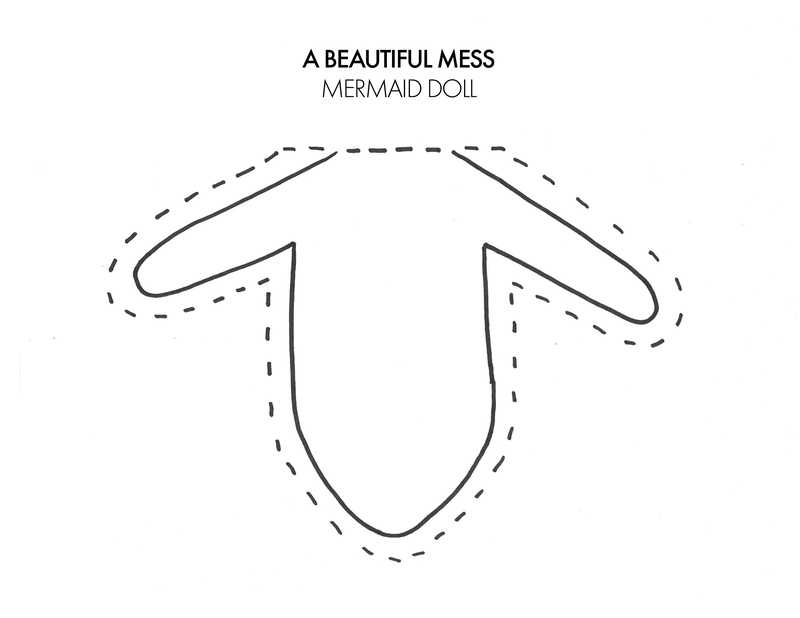 Great to find a free pattern, for an easy to achieve, attractive mermaid. 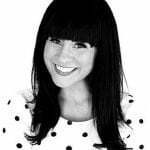 Th women we support all have experience of mental distress / illness and or addiction and I love seeing their whole demeanour brighten when they are successful making something they love. Can’t wait for tomorrow. Thanks from Aotearoa (New Zealand) . Hi Margie! If you right click, you can download the patterns and then print them. Email us at support AT abeautifulmess DOT com if you need anything else!